Highly respected swimming coach Brian Gallagher took a small but talented Wood River High School team to the Idaho State High School Swimming Championships in Boise, Nov. 4-5, and came home with a new trophy, a new state record and three new school records. Coming off of their stellar performances at the High School Regional Championships last week, eight girls and six boys qualified for the prestigious statewide championships. Competing against 48 high school squads, the WRHS girls team brought home the silver, finishing a solid second to a larger Boise High School team by just 43 points. The boys finished ninth, their best performance since the inception of the team. Junior Lena Friesen starred for Wood River as she set a new Idaho high school record in the 200-yard medley with a time of 2:07.44. She also set a new WRHS record in the 100-yard freestyle with 53.76. Friesen, along with senior Elizabeth Fry, freshman Kaedi Fry and sophomore Kelsey Syms, led the 200-yard freestyle relay to a new WRHS record with 1:55.29. Junior Tayler Bates placed seventh in the 200-yard freestyle with Elizabeth Fry winning the consolation heat. Wood River dominated the 200-yard medley with Friesen coming in first place, Kaedi Fry taking third and junior Colby Werley taking fifth. Bates placed seventh in the 100-yard fly with Syms winning that consolation heat. Elizabeth Fry took sixth in the 500-yard freestyle against a tough field in the finals. The 200-yard freestyle relay of Syms, Bates, Werley and senior Tori Emerick placed fourth in the final. Kaedi Fry placed sixth in the 100-yard back finals as Emerick and Syms added points in the consolation heat, finishing 12th and 15th, respectively. Werley finished the 100-yard breaststroke in fifth. Wood River's 400-yard freestyle relay team of Elizabeth and Kaedi Fry, Werley and Friesen stroked to third. The Wood River boys team of six raced to its best results to date at the state level. The 200-yard medley team of junior Markus Lemma, senior J.T. Sutton, sophomore Luke Verst and senior Adam Potts placed eighth in the finals. Potts and junior Gus Kimball added points by placing 10th and 13th, respectively, in the 200-yard freestyle consolation. Sutton took 11th in the 50-yard freestyle and 12th in the 100-yard freestyle consolations. Potts placed 10th in the 500-yard freestyle consolation while Kimball took 10th in the 100-yard breaststroke consolation. Wood River's 200-yard freestyle relay team of Kimball, sophomore Logan Johnston, Verst and Lemma added points for the boys with a 13th place in the consolation heat. In 400-yard freestyle relay, Potts, Johnston, Kimball and Sutton placed second in the consolation heat. 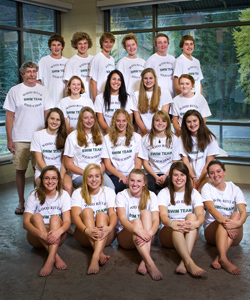 The High School State Championships end a highly successful 2011 High School season for Gallagher's Wood River team; however, most of these swimmers will continue to train with him on the Sun Valley 5B year-round team and competing in U.S.A.-sanctioned meets throughout the region.